A family business with a passion and dedication for the industry, Shivani Gems honors integrity, trust and dedication. We hold ourselves to the highest standards in order to develop long lasting business relationships with our fiercely loyal customers. 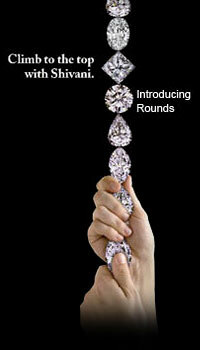 Shivani Gems has established itself as a major supplier of fancy shaped diamonds. Initially, Shivani specialized in Marquise, Pear Shaped & Oval diamonds, carving out a unique niche in the marketplace as the largest wholesaler of those fancy shapes in the world. Shivani expanded on this success and now supplies Marquise's, Pear Shapes, Ovals, Princess Cuts, Heart Shape and Rounds across the globe. Our offices are located in New York, Antwerp, Mumbai, Bangkok & Hong Kong. We cater to various independent retailers all over the world as well as with major retailers of the industry. Currently, we are experiencing tremendous growth in our unique jewelry department with an exciting new stud, pendant and solitaire fancy shape jewelry program. With strategic locations around the world, Shivani has the wherewithal to supply your loose diamond and diamond jewelry needs no matter where on the globe your business resides.